Playing Max: the Curse of Brotherhood with the Xbox One controller feels a bit like running through an up-scaled iPhone game on a much bigger screen. As you might imagine, that's both a good thing and a bad thing. The Curse of Brotherhood has a lot going for it. Lead character Max must rescue his annoying younger sibling Felix after mystically teleporting him to Anotherland, an alternate plane of existence ruled by a tyrant named Mustacho. The CGI cartoon-style visuals come to life with funny exaggerated animations and the art direction for the backgrounds never fails to feel well-imagined. MtCoB's tunes—a catchy mix of funky upbeat tracks and moody interstitials—will stay in your head long after you finish playing, too. But, the main draw here, of course, is MtCoB's clever core mechanic. It consists of using the left analog stick to draw on the screen to spontaneously generate pillars of stone, fireball arcs, tree branch pathways and high-pressure water flumes. 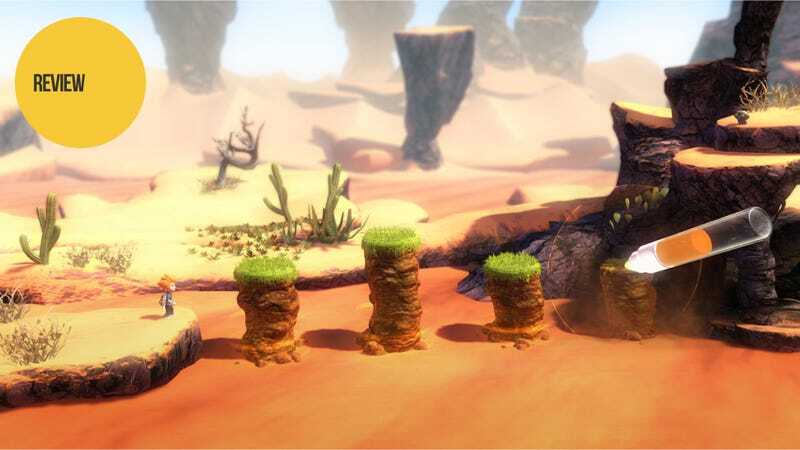 Players will have to mix and match these abilities—all contained in Max's magic marker—to throw projectiles back at enemies, rocket themselves across the screen and swing away from danger. The drawing mechanic really makes it feel like you've got more customized control over Max's fate than in most other platformers. With enough skill, you can make the ledge you need to get to the end of a level's chapter. And when you string the various powers at Max's disposal in an impressive manner—water flume to vine swing to earth pillar—the game begins to feel like a sharp evolution of platformer design. But then the frustration creeps in. There's very little by way of hints in this game and succeeding in Max's adventure is all about reading the environment and figuring out what power needs to be used where and when. That part's fun. What isn't fun is the anger that bubbles up after failing to solve the same puzzle after 30 minutes. The trajectory for the jets of H2O won't go where you want them to. Making right angles on a branch that you need to jump up on makes you crossed for having to do it too much. If MtCoB were the kind of physics-based puzzler that let you craft the right sequence in a more leisurely fashion, the finicky nature of the controls would be tolerable. But the latter third of the game forces the player to chain together magic marker creations with an increasing degree of speed and precision, while also being plagued by giant monsters, bubbling lava and crumbling bridges. Simply put, pushing an analog stick in a direction isn't the same as dragging your stylus or finger across a touchscreen. The conceptual precursor to The Curse of Brotherhood—Max and the Magic Marker—showed up on the Wii and iOS, platforms where gesture is king. And even though this new Max game was built for the Xbox 360 and Xbox One consoles, it still feels like the concept and controls are trying mightily to bridge the gap between two different types of hardware. I really liked the humor, friendliness and gameplay challenge in Max: the Curse of Brotherhood. But I can't recommend it in good conscience, knowing how much frustration awaits potential players who might grind their teeth as much as I did. The game wants you to feel like you're drawing magic into its polygonal world but the actual experience puts players at the mercy of an inexact science.